“Contrary to growing concerns about a potentially slowing U.S. economy, job creation surged in December as measured by the latest ADP/Moody’s Analytics survey released Thursday,” Jeff Cox reports for CNBC. MacDailyNews Take: Very good macroeconomic news is always good news for companies like Apple whose products and services require customers with discretionary income and the will to spend it. Working at Starbucks or Amazon doesn’t count. Those would be seasonal jobs and are temporary. 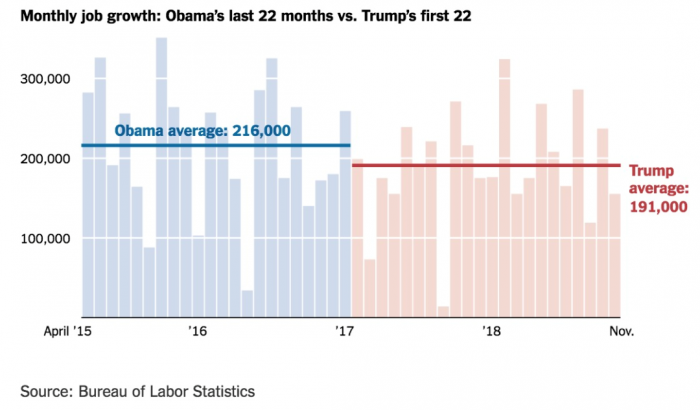 To be honest, the creation of jobs during the last 22 months of Obama were higher than the first 22 of Trumpov. In constant Dollars wages have been declining for years. Wages for the non executive class have not kept up with inflation. In the not too distant past one income could provide a nice Middle Class lifestyle and now 2 cannot for many. 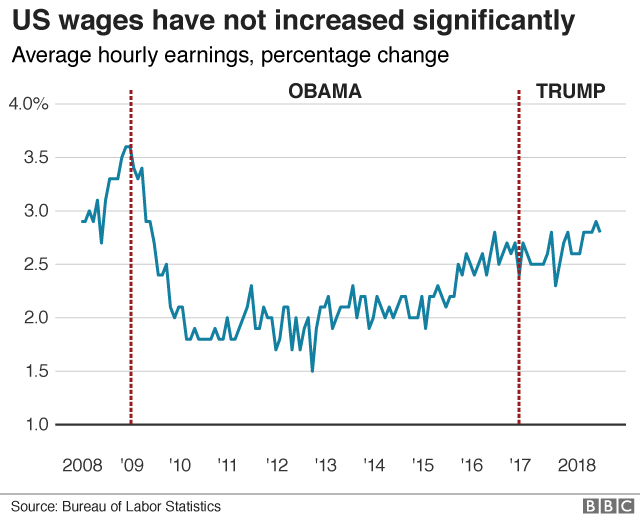 Registered Voter cites a article reporting that average hourly earnings rose in September by the greatest amount since Obama accomplished a superior result. But DavGreg is correct — this is cherrypicking. The overall wage trend in the USA when corrected for inflation and cost of living is basically flat (average inflation is running near the Fed goal of 2%). And of course the AVERAGE masks the fact that the richest few take the biggest gains while the poorest masses are barely keeping up with historically low inflation. The low wage workers cannot keep up with inflation because their full-time jobs are in China now. Low skilled Americans stitch together 2 and 3 dead end jobs to make ends meet. As Trump destroys the value of the dollar, those workers will be in worse shape than they were 5 years ago when ultra right-wing talk show hosts doubled down their fearmongering to convince the working class that slow constant positive growth isn’t good. The message was that electing a dumbass rubber stamper president who would sign McConnell’s Friends & Family Tax Fraud bill and distract wage earners away from the corporate cronyism now rampant in the world would eventually make the shrinking middle class “great again”. Do you feel great, American citizens? Let’s also keep in mind that the liar-in-chief can’t declare he has ushered in the greatest economy ever because the postwar period of his childhood is long gone. The 4.9% GDP growth that Obama offered in the 3rd quarter of 2015 is long gone. Now that Trump has shown how inempt he is in negotiating (despite his claims to the contrary), worldwide trade is in disarray. Instead of rallying with its (former) allies to press China to adopt greater transparency, fair trade practices, and dramatically better labor and environmental standards, the USA is in a war of egos, with Trump holding no cards. The impact of the $US 250 billion tariffs unilaterally slapped on Chinese imports to the USA has yet to be felt by US consumers. So to mask that disaster, the brilliant self promoter chose to lay off 1% of the American workforce. Now border agents are working without pay. TSA and FAA isn’t being paid, so airports can’t function efficiently. The Coast Guard isn’t guarding the coast. Is there any better way to sabotage the US economy for the working man? It’s hard to see the real effect of stupid executive decisions from maralago. That’s it folks. Sunday he escaped for the day to Camp David for a rest from his zero activity Saturday. This is your hard working president ensuring future prosperity for your kids. No wonder the huge jump in real economic trends Trump claimed would occur didn’t, and the positive slope of most economic measures are softening. Because as Cook proves every day, you can only coast so long before the facts catch up with you.